Can you spell “capybara” or “boanthropy”? 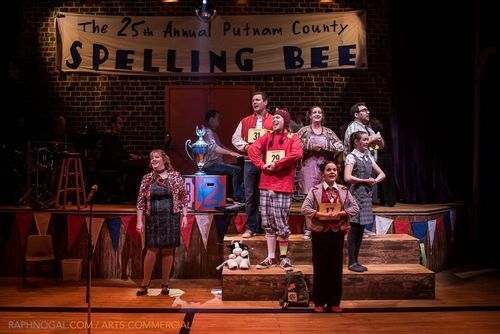 You’ll have them down pat after watching The 25th Annual Putnam County Spelling Bee at the Scarborough Village Theatre. And no need to bring a dictionary–you’ll get lots of definitions of obscure words throughout this charming performance. These tweens are quirky. Progressive Logainne (Nicole Marie McCafferty), hormonal Chip (Carson Betz), foot-dependent William (Jeremy Mesiano-Crookston), prim and proper Marcy (Rebecca Field), sensitive Olive (Katie Wise), and strangely dressed Leaf (Leete Stetson) make up a loveable bunch of oddballs with the same goal in mind — to become the next spelling bee champ. It’s a treat to hear them spell, sometimes while they sing and dance! Their powerful voices bring the story to life. I especially liked hearing Ms. Rona Peretti (Shannon Lew), who belts out her numbers with a teacher-like scarf around her neck. The flashbacks also make the characters more complex; many mini-stories illustrate each kid’s personal struggles. In terms of set design, I enjoyed watching the musicians in action at the back. It was cool trying to figure out how they were making the slow-motion sounds in one particularly bizarre scene. I also loved how the the judges’ desk rolled around the set during the dancing and singing; it kept the scenes dynamic. Something unique: the long-term commitment from three lucky spellers from the audience! I think they got more than their fifteen minute of fame. This trio of spectators were integrated smoothly into the show, thanks to the cast who helped them boogie in the right direction as well as the clever writing by Rachel Sheinkin. Donald Trump (T-R-U-M-P) provided a good laugh; it was the second time in a few months that I’d heard jokes on stage made at his expense. Other things that brought a smile to my face were Logainne’s lisp, the swagger and smirk of the black-clad Comfort Counselor (Todd Appleton), Chips’ embarrassing moment, Olive’s ode to her dictionary, and Marcy’s posture. The only small piece that didn’t sit well with me was the promotion of the 50-50 draw in which we could participate during the intermission. It seemed a bit out of place. 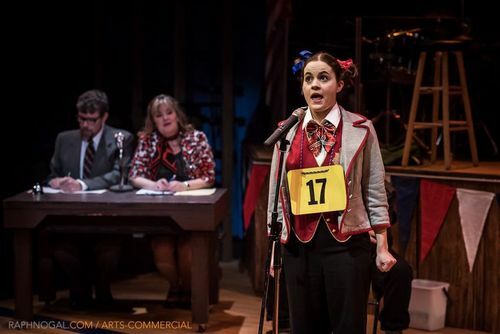 But all in all, music and word lovers everywhere will enjoy The 25th Annual Putnam County Spelling Bee. Showtimes: February 11, 12, 13, 18 and 19 at 8 p.m. and February 14 and 20 at 2 p.m.
I’m not with this group, but just an FYI that the 50/50 is a community theatre staple. These are volunteer organizations mounting the shows and these small fundraising efforts are what help keep us all afloat to keep producing our works.